It breaks my heart every day hearing the horrible news of the experiences of the refugies. Just today in Austria a truck had an accident because it was stuffed up with people coming into the country illegally trying to find a new life in a different part of the world. It is so very sad. 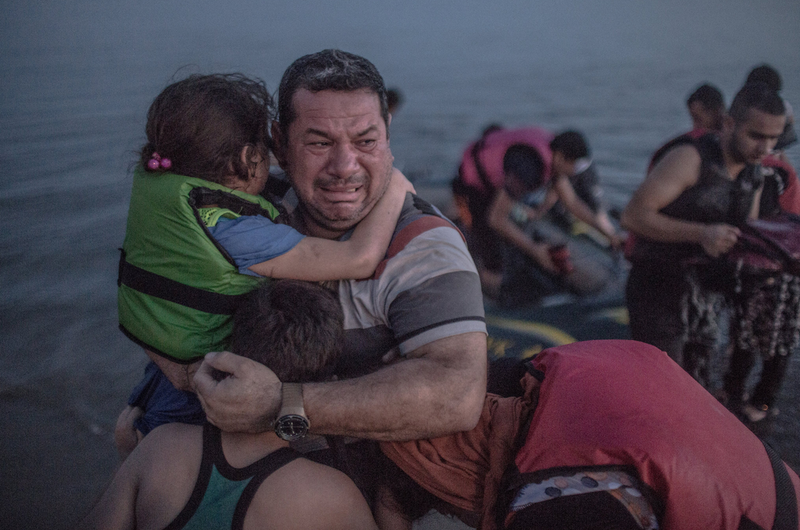 Take a look at migrants … walk in their shoes. This is Syria … it’s everywhere! Looking for a better, peaceful place! Backlash growing against illegals from US southern border. But one fact remains that the conversation is not including this question: If you were a parent that lived in a country where your teenage son would be executed if he did not join a drug gang or be a part of one army or another and if your 11 year old daughter could expect to be raped any time she stepped out of the door , wouldn’t you do anything to get them to the USA ? Its a difficult question. I have to point out though there’s a difference between migrants – people who come because they want to improve their living conditions and refugees (like those in this picture). America should certainly remain open to refugees fleeing war or religious persecution. Yes its terrible.. And I can only see many more fleeing and wanting a safe place of refuge for their families.. I have thought deep about the thousands in thisplight often.. And I think of all the spare rooms people have within their homes.. As I see migrants sleeping rough on streets after leaving everything they possess behind.. Often giving their life savings to flee from their desperate situations so their families are safe..
We are all God’s children. We must find ways to take care of the basic needs of each other. This is what I have been writing about lately. What have we become? Thanks for sharing pictures and posts on one of the most important topics of these days. It is of such high importance to keep in mind and heart the faces and feelings of those who lost everything and have to find a new place to be. Those images almost broke my heart. . . . how can people be so mean. Gripping image, rips right into us. Your poem’s question at the onset, “Why are we afraid to share?”…. What a powerful photo. No one should ever be forced to go back into a land where death is imminent. Would the people who try to force them out, do the same to their family? I think not. On that note however, I do firmly believe that we should also be very careful about who we let in. There should be background checks done on everyone. No country wants to put their citizens in danger by those they bring in. But, if they’re not a threat let them come. The United States was founded on immigration. It truly saddens me when people in my country are so angry and hostile towards immigrants. It’s as though they’ve forgotten their roots entirely. And we’re really not that old of a country, relatively speaking. You’d think we’d remember that nearly everyone here came from somewhere else and that we wouldn’t be so hostile towards others coming to our shores. But so it is, and it truly saddens me. I vote with my conscience and treat everyone as an equal. However, I am but one person, a voice in the storm. Maybe it’s time that more people spoke up? It never ceases to amaze me how we know so well what we “should” do, and how very often we seem to just not be able to pull it off. So instead of welcoming these people with open arms and caring for them like any good host would, we just treat them like parasites, give them the minimum supplies we need to without violating basic human rights, and then spew racial slander at them whenever possible. Isn’t it time we stopped playing this silly game? Who are we really? Because you know, all it really takes is a decision. If we decide we can do better, then we can. It is really that simple, once you stop making excuses. I’m going to start tomorrow, and i’m going to have a plan. Tomorrow I’m going to start a new organisation. There will be no fee’s to pay, there will be no annual meetings, there will be no religious overtones, there won’t be membership cards, there won’t be any badges or ranks… the only thing you need to do to join this organisation is just take right action. This organisation is going to simply be the change you want to see in the world, and all it’s members are going to reflect that. We’re going to be that cashier who called you back to say you had a 50 folded in the buck you paid with. We’re going to be that TV repair guy who cut you a special deal just cause you couldn’t really afford to hire him. We’re going to be that weird guy who takes the dogs at the animal shelter for walks, just so they could get out. We’re going to be those people who drop a coin into the poor box, we’re going to be those who help old ladies across the street, nurse wounded animals back to health, drive the deer to the hospital we found ran over by the side of the road, that lady who talks to the crying kid who seems lost. We’re going to be that person you all secretly wish you were, if only you had the balls to. And yes, we’re going to be those people who will help the refugees feel welcome, and help them start a new life here, if that’s what they wish. Write and article about this? Puhleazzze? I’d love to, as i feel i do have quite a bit to say about this. I have to check my schedule to see if i have some time to write more about this.